A Louisiana producer contacts you regarding high mortality rates in his channel catfish (Ictalurus punctatus) from multiple ponds on his property. The majority of fish affected are smaller in size and are commonly seen swimming listlessly near the water's surface. He sends you multiple specimens, along with water and benthic sediment samples. 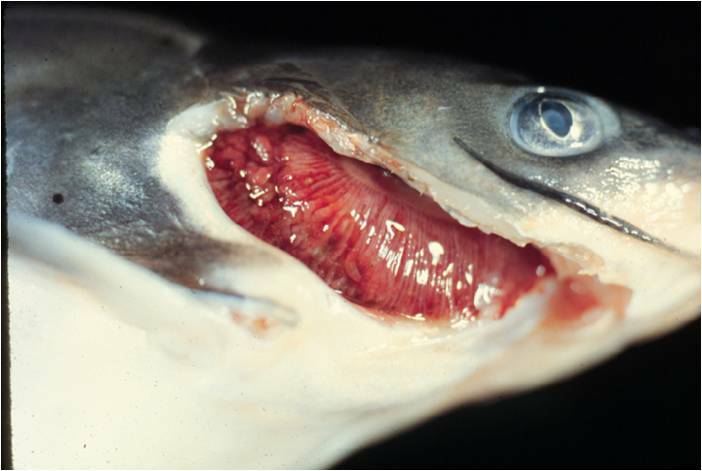 Gross lesions are limited to the gills, which are swollen, fragile and bleed easily, and have a red/white mottled appearance. Histologically, you note granulomatous branchitis, with cartilage necrosis, inflammation, and hyperplasia. Also, myxozoan parasites are present, and are surrounded by inflammatory cells. Water and benthic zone sediment samples reveal the presence of actinospores (left) and the oligochaete, Dero digitata. 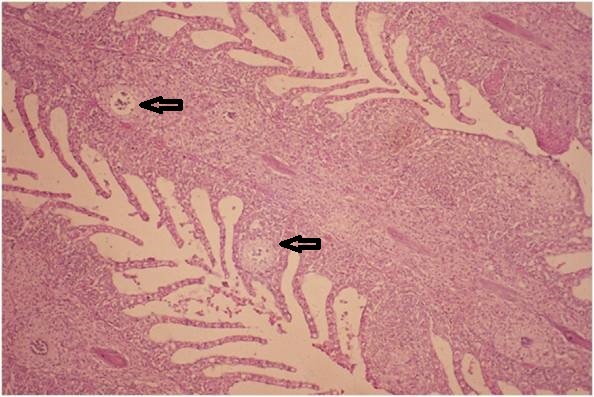 The catfish are being parasitized by Henneguya ictaluri, which causes the pathognomonic proliferative gill disease (PGD) commonly called "Hamburger Gill". The proposed lifecycle involves channel and blue catfish and the common oligochaete Dero digitata. Actinospores are released into the aquatic environment by D. digitata. Fish come into contact with the actinospores orally or through the skin or gills. Development to the final myxospore stage in fish occurs in the gills. Upon release into the environment, the myxospores infect D. digitata oligochaetes. The myxozoan has been associated with commercial fish die-offs in the southeastern United States, typically during the Spring and Fall. Case provided by NCVP Merck Resident Dr. Cassan Pulaski at Louisiana State University. Photos taken by John P. Hawke.